U.S. flag flying in front of the Utah State Capitol. Utah State Capitol image. 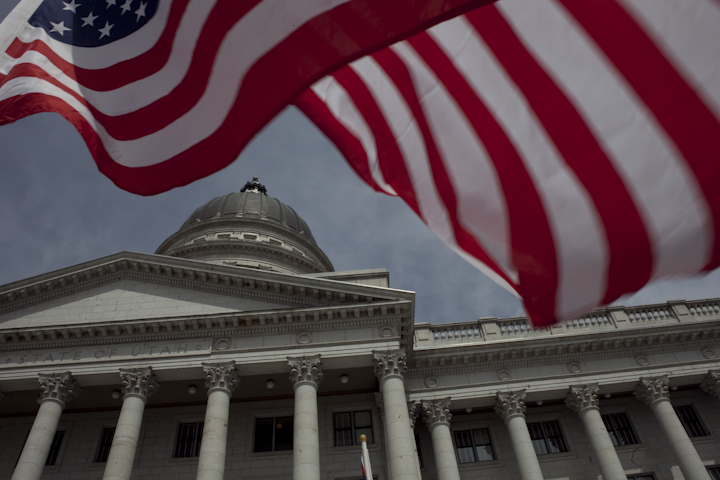 U.S. flags fly in Utah today in honor of Utah statehood. It’s also the day that new, elected state officers take their oaths and take their offices. Utah is 121 years in the union — as a state, it’s old enough to drink, though you may have difficulty finding a drink there among the teetotaling Mormons. Happy birthday, Utah! 121 years old today. One of my favorite Utah photos: U.S. flag at the south end of Mount Timpanogos; photo from Orem, Utah, by Bob Walker. This entry was posted on Wednesday, January 4th, 2017 at 4:11 am and is filed under Flag etiquette, Fly your flag today, History, Statehood, Utah. You can follow any responses to this entry through the RSS 2.0 feed. You can leave a response, or trackback from your own site.